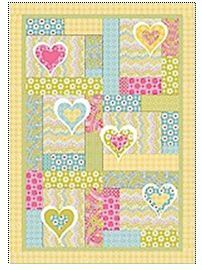 Daisies and hearts and zigzags, oh my! The Lizzie collection is sure to make you burst with excitement. Cheery floral daises dance with colorful swirls that pair perfectly with silly stripes and decorative dots. A playful bouquet of large scale petals and happy prints are dressed in three color ways of doll pink, leaping lizards green and true blue. Throw in a burst of sunshine yellow and this collection is fit for that special girl in your life! Lizzie quilt measures 63″ x 90″. This entry was posted on Monday, July 19th, 2010 at 2:13 pm and is filed under Uncategorized. You can follow any responses to this entry through the RSS 2.0 feed. You can leave a response, or trackback from your own site.